A couple of months back, I was having one of those sudden urges I occasionally get to read a book immedietely. Such urges have an uncanny ability to creep in exactly when there is not a single good book within reach. But they are also compulsive, and I couldn't give up. I scoured my uncle's place thoroughly, and located a few books that I had to do with. One of them was this interesting looking book that you see below. Since my work is related vaguely to the oil and gas industry, I decided to do something that I seldom do : mix business with pleasure. 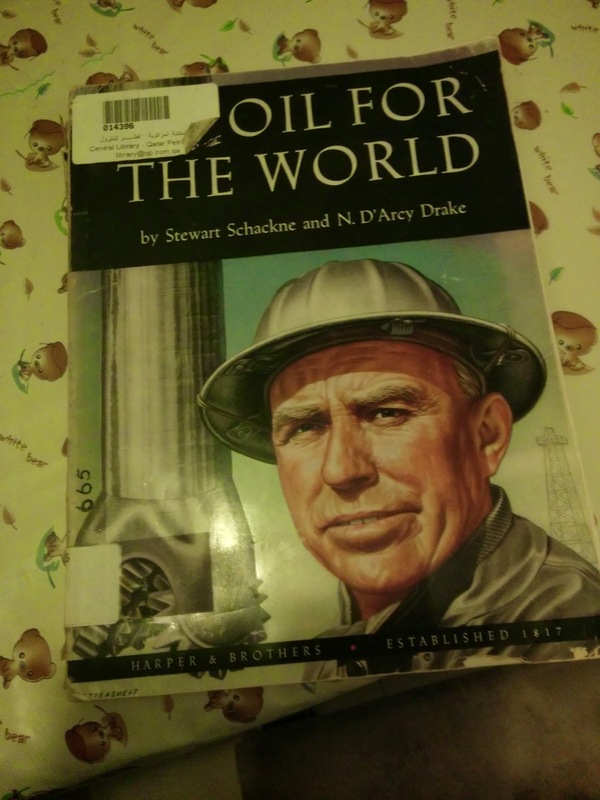 Oil for the World by Stewart Schackne and D'Arcy Drake was published in 1955. The book seems to be extremely rare - Amazon has a used copy of it, but it is available neither on Wikipedia nor on Goodreads. The short book talks about the myriad benefits of oil and various oil products, gives a brief introduction on the history of discovery of oil, touches upon the common methods of oil extraction and exploration, and lays down a prediction of the usefulness of oil in the future. Considering the pace at which technology is advancing, it is amazing to think that a technical book written 60 years ago has a few things that are still relevant today. What interested me the most is the tone of the whole book. The authors, if one can take the privilege to judge a writer by his writing, seem to be from a right-leaning political ideology. The book is clearly meant for an American audience and might not have been expected to trot around the globe, but a conviction of the greatness of America emanates throughout the book. And the tone is infectiously enthusiastic, detailing about all the known uses of oil, and how new oil-rich regions were continuously being discovered. It also stresses the idea that the potential of oil was not yet realized, and that oil was not being used as much as it should have been. Obviously, it is impossible for the authors to have predicted a future where oil would be an extremely expensive product, apart from being exhaustible resource with harmful consequences to the environment. Today, we fight wars over oil. Children are killed for oil. Growing up in such an environment, it amused me to no-end to notice the optimistic tone this book repeatedly takes while talking about the oil reserve remaining in the Earth. It is as if the authors believed that there is an unlimited supply of oil. Or even more likely, they severely under-estimated the human capacity to consume oil. Imagine this happening to us sixty years later. Visualize a bored guy with nothing better to do coming across our writings, and laughing at us taking for granted a thing that would become rare in his time; a thing that would cause wars, deaths, and destruction all around. What could such a thing be? Frankly, I have no idea. But let me engage my fantasies, and venture a wild guess : Happiness! Imagine us using up happiness as if it is an unlimited resource, only to find that it is formed by the fossilized remains of dead people, and we need to wait for more people to die and be processed before we could extract any more happiness. Imagine that us being recklessly happy is gradually boring a hole in the Ozone layer, letting in more harmful radiations. Picture a day when our children grow up to find that there is no more happiness left around. Do you really want such a bleak future for our children? Don't you want to be sustainable? Shouldn't we take more care that we don't waste happiness, and use it more optimally? Happiness is positive energy, as it is drilled often into us. And we all know that energy can neither be created nor destroyed, it can be only transferred from one (human) form to another. So, at any moment when you encountering exhilarating happiness, at whose cost is it? Fine, I will admit it. That is extremely stupid. My wild guess is too wild, and does not have a single shred of logic in it. It is ludicrous. But my preposterous theory is just a response to an equally ludicrous, if not more, news item that provoked me. As per the news item, Chief Happiness Officer is a new job description that is attaining prominence in silicon valley corporations. Following the lead of Google, supposed to be one of the best employers around, these companies are monitoring how happy their employees are, and attempting to increase the happiness of their employees. In this quest, the employees are subject to constant surveillance. And why are they doing this? They are implementing ideas from "scientific studies" that show that happier employees are more productive that normal employees. I feel extremely unsettled by this. Think of what could happen when corporates start monitoring the happiness of their employees and potential employees. For instance, a potential employee who has just lost a family member would have unfair hurdles in getting a job, as he/she might "lower the productivity" of the company. The whole idea is Orwellian. I wonder how such studies measure happiness, a term that is excessively vague. As as example of its vagueness, consider the entry for Happiness in the Stanford Encyclopedia of Philosophy (a very useful website for people who want to understand Philosophy, and people like me who want to pretend that they do). The entry starts by mentioning that there are two different senses of using the word "Happiness", remarks that both of them are often confused with each other, and then goes on to use the term in both senses confusingly. Study or no study, happiness is ill-defined, and over-rated - at least in one sense of the word. Here is a comic that tries to explore the two facets of happiness. Admittedly, it can be argued that momentary happiness is just caused by enzymes such as Serotonin. Studies have shown that running makes people happy. Drugs can make one happy, at least temporarily. Thinking that one is happy makes one happy. In fact, a casual glance at any social networks makes it seem like everyone everywhere is happy. "I enjoyed my weekend with curd rice and pickle at Muniyandi Vilas. The pickle was a bit salty, but the curd rice was delicious. Had a wonderful time with my best-friends" [attach all-smiles selfie with incompatible roommates, and then fight over whose turn it is to pay the bill]. But again, happiness caused in such an unnatural way does not last for long. Are such momentary pleasures what we desire? While the previous generation was burdened by conservative and close-knitted societies that hated novelty, we are burdened by a desire to show the World that we love our lives. Those who don't become social outcasts by an unspoken code of modern society. Happy birthday, happy new year, happy holidays, happy weekend, happy married life, happy-second-anniversary-of-the-day-you-came-third-in-lemon-and-spoon-race, happy 14/14/2014, happy pets day, happy this and happy that. We are always expected to be happy, and we constantly feel the need to be happy, or at least project that we are happy. The French revolution changed all existing ideals in life. Until then, religion was the highest virtue. People were more worried about happiness after death than happiness in life. While the revolution brought in a welcome change, it seems that we are gradually moving towards another extreme; of valuing ourselves, our passions, our abilities, and our pleasures too highly. What we need is an acceptance of the fact that happiness is just a part of life, and there a myriad other emotions we need to learn to deal with. We need to realize that it is okay to be sad. Like Seneca famously quipped "What need is there to weep over parts of life? The whole of it calls for tears". It might seem as if I am an advocate of pessimism, and I probably am. But I don't think so, for all I want is a little bit of moderation. And the only way to deal with ludicrous excesses of optimism is with some excessive pessimism. Which is why, my (current) favorite living Philosopher is Alain De Botton. After watching a few of his talks, I have finally managed to start reading his boook : The Consolations of Philosophy. Google him, check out his talks, and read his articles. "We are not only unhappy, but also— believing calm and happiness to be the norm—unhappy that we’re unhappy", he says in an article, and I completely agree with him. No wonder we have people who seem to possess every reason to be happy, and are still depressed. Happiness is probably a limited resource, after all. The poetry of happiness depends on an element of surprise. It is lithe and built like a jungle cat. Adept in the art of camouflage, capable of consummate stillness and able to traverse large distances with great velocity. In ill-advised moments you find yourself stalking it through the jungle of the day with your too-loud feet and bad-timing (your species was not built for stalking). Later, in an unguarded moment, happiness will pounce on you. Roll you to the floor with soft paws and sit on your stomach gleefully. Joy will swallow you whole. Because you are prey to happiness. And always have been. Not the other way around. It. Has. Never. Been. The other way around.